Are you searching for vent cleaning services? You probably are familiar with waking up in the morning and sneezing like if you were allergic to something when you are not. What happens is that dust mites on the air can cause allergies during the AC or heater running at night, making you more sensitive in the morning. Also, if the filters are not cleaned periodically, you might experience discomfort in your nostrils. If you are feeling these symptoms, Air Purification Technologies is here to help! We offer a free estimate to check all your air vents, and we guarantee you will feel the difference within your breathing environment. 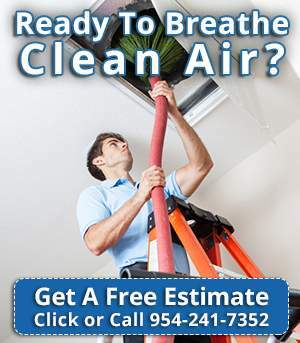 Air Purification Technologies has been offering Vent Cleaning Services in South Florida since 2002. Our integrity and professionalism will exceed your expectations. We provide a fresh and clean air environment, so your family feels always comfortable inside your home. We use the latest sanitizing, intensive Rotobrush equipment that meets all EPA standards, guaranteeing the deepest cleaning of your vents. Upon arrival at your home or commercial establishment, we will show you what is the actual condition of your vents and the procedure involved to improve your breathable air environment. Rest assured we use state of the art equipment, taking into consideration the National Air Duct Cleaning Association’s (NADCA) standards; in addition to only using the best EPA registered products. the Airocide’s fan slows allergy triggers, mold spores, and fumes. When these allergens make contact the surface, it breaks them down to a molecular level. The oxidation process, known as oxidation, is safe, and highly effective with no ozone harm to the environment. With our ultra-violet light system, we can see every single hidden area that needs to be clean from allergens, dust, and mildew. Our Air Purification Technologies technician has the training and knowledge needed to deal with the procedure of cleaning your vents deeply with the standards that apply to the industry.